Seaport town in Apulia, Italy, on the Adriatic; capital of the district of the same name. As the center of an extended trade with Triest, Corfu, Messina, and the Orient, Bari was at all times a place of importance; information, however, concerning the history of the Jews there is very scant. According to tradition, the settlement of the Jews in southern Italy is connected with the captives brought there by Titus after the sack of Jerusalem (Jerahmeel, in Neubauer, "Medieval Jewish Chron." i. 190; Ahimaaz, "Chronicle," ib. ii. 112, line 4; "Jewish Quart. Rev." iv. 623). If there is any truth in this tradition, then together with Naples, Venosa, Otranto, Taranto, and Oria, Bari must at an early date have become a seat of Jewish influence. "The inhabitants of Bari ( ) came out to meet them, together with the people of the other cities [perhaps Taranto and Otranto, "Revue Etudes Juives," xxxiii. 40]. They saw that the Jews were naked. What did the people of Bari do? They unclothed their male and female slaves, and brought them as a present to Nebuchadnezzar, saying, 'Perhaps thou art a king that taketh delight in the naked?' He answered, 'Go, and put thou garments upon the Israelites.' And what was the reward of the people of Bari? God Almighty endowed them with more grace than that possessed by all the land of Israel; and [therefore] they are more beautiful. The saying was current, 'No one who enters the city [Bari] leaves it without having committed a sin' [referring to the beauty of its women]." The same account is found in Midrash Tehillim; and with a few additions in the Pesiḳta Rabbati (28; ed. Friedmann, p. 135b), a work composed about the year 845. The historical background of the legend is not quite apparent. 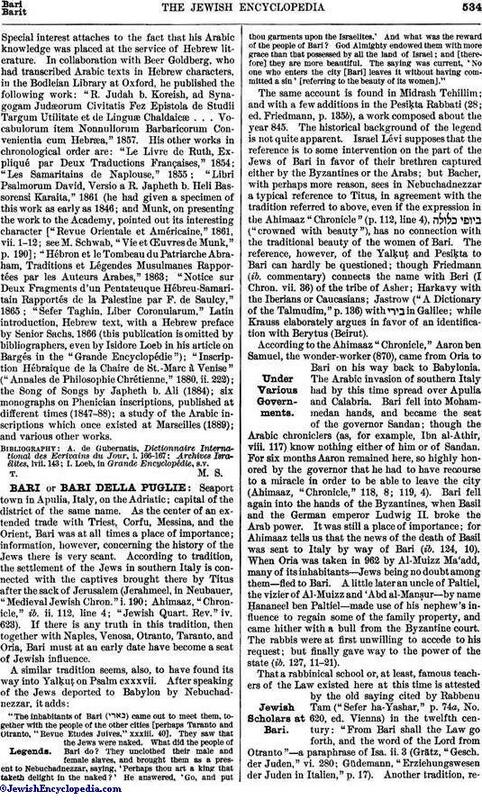 Israel Lévi supposes that the reference is to some intervention on the part of the Jews of Bari in favor of their brethren captured either by the Byzantines or the Arabs; but Bacher, with perhaps more reason, sees in Nebuchadnezzar a typical reference to Titus, in agreement with the tradition referred to above, even if the expression in the Ahimaaz "Chronicle" (p. 112, line 4), ("crowned with beauty"), has no connection with the traditional beauty of the women of Bari. The reference, however, of the Yalḳuṭ and Pesiḳta to Bari can hardly be questioned; though Friedmann (ib. commentary) connects the name with Beri (I Chron. vii. 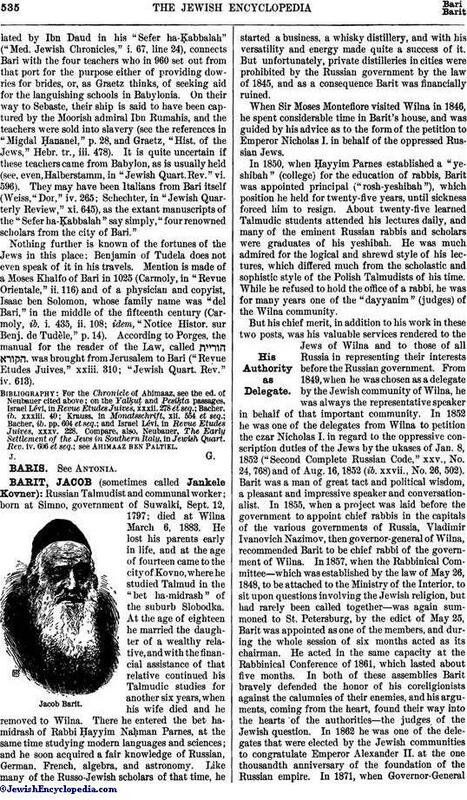 36) of the tribe of Asher; Harkavy with the Iberians or Caucasians; Jastrow ("A Dictionary of the Talmudim," p. 136) with in Galilee; while Krauss elaborately argues in favor of an identification with Berytus (Beirut). According to the Ahimaaz "Chronicle," Aaron ben Samuel, the wonder-worker (870), came from Oria to Bari on his way back to Babylonia. The Arabic invasion of southern Italy had by this time spread over Apulia and Calabria. Bari fell into Mohammedan hands, and became the seat of the governor Sandan; though the Arabic chroniclers (as, for example, Ibn al-Athir, viii. 117) know nothing either of him or of Sandan. For six months Aaron remained here, so highly honored by the governor that he had to have recourse to a miracle in order to be able to leave the city (Ahimaaz, "Chronicle," 118, 8; 119, 4). Bari fell again into the hands of the Byzantines, when Basil and the German emperor Ludwig II. broke the Arab power. It was still a place of importance; for Ahimaaz tells us that the news of the death of Basil was sent to Italy by way of Bari (ib. 124, 10). When Oria was taken in 962 by Al-Muizz Ma'add, many of its inhabitants—Jews being no doubt among them—fled to Bari. A little later an uncle of Paltiel, the vizier of Al-Muizz and 'Abd al-Manṣur—by name Ḥananeel ben Paltiel—made use of his nephew's influence to regain some of the family property, and came hither with a bull from the Byzantine court. The rabbis were at first unwilling to accede to his request; but finally gave way to the power of the state (ib. 127, 11-21). That a rabbinical school or, at least, famous teachers of the Law existed here at this time is attested by the old saying cited by Rabbenu Tam ("Sefer ha-Yashar," p. 74a, No. 620, ed. Vienna) in the twelfth century: "From Bari shall the Law go forth, and the word of the Lord from Otranto"—a paraphrase of Isa. ii. 3 (Grätz, "Gesch. der Juden," vi. 280; Güdemann, "Erziehungswesen der Juden in Italien," p. 17). Another tradition, relatedby Ibn Daud in his "Sefer ha-Ḳabbalah" ("Med. Jewish Chronicles," i. 67, line 24), connects Bari with the four teachers who in 960 set out from that port for the purpose either of providing dowries for brides, or, as Graetz thinks, of seeking aid for the languishing schools in Babylonia. On their way to Sebaste, their ship is said to have been captured by the Moorish admiral Ibn Rumahis, and the teachers were sold into slavery (see the references in "Migdal Ḥananel," p. 28, and Graetz, "Hist. of the Jews," Hebr. tr., iii. 478). It is quite uncertain if these teachers came from Babylon, as is usually held (see, even, Halberstamm, in "Jewish Quart. Rev." vi. 596). They may have been Italians from Bari itself (Weiss, "Dor," iv. 265; Schechter, in "Jewish Quarterly Review," xi. 645), as the extant manuscripts of the "Sefer ha-Ḳabbalah" say simply, "four renowned scholars from the city of Bari." Nothing further is known of the fortunes of the Jews in this place; Benjamin of Tudela does not even speak of it in his travels. Mention is made of a Moses Khalfo of Bari in 1025 (Carmoly, in "Revue Orientale," ii. 116) and of a physician and copyist, Isaac ben Solomon, whose family name was "del Bari," in the middle of the fifteenth century (Carmoly, ib. i. 435, ii. 108; idem, "Notice Histor. sur Benj. de Tudèle," p. 14). According to Porges, the manual for the reader of the Law, called , was brought from Jerusalem to Bari ("Revue Etudes Juives," xxiii. 310; "Jewish Quart. Rev." iv. 613).